I've been putting together welcome baskets for a few VIPs. Out and about, I found a few inexpensive gifts which would be perfect for Mother's Day! Our Dollar General always has cheap videos. Still, the cashier and I were shocked to see Martha's Baking Favorites and Martha's Favorite Family Dinners on DVD for $3 there. Amazon sells these for $12. Marie is offering bottles of Watkins Double-Strength Vanilla for $13, including shipping. 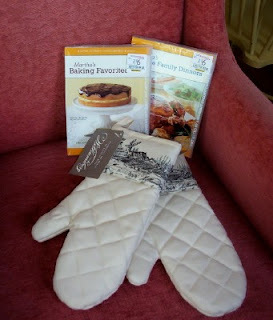 Wouldn't that be nice with a Martha's Baking Favorites DVD? Right now Big Lots has loads of Yogi organic teas. This gorgeous box of St. Dalfour Organic even includes a free blue and white sugar spoon ($1.50). Continuing the pretty packaging theme, I overpaid for these beautiful bars of dark chocolate studded with pecans and cranberries ($1.50). Make it teatime by adding a box of Anna's Thins for only $1 more. These scalloped Swedish cookies come in ginger, almond, and coffee flavors. The backseat of my car can attest to their deliciousness. Nice ideas. I love giving gift baskets and all these items look like they would make lovely additions. Oooh! How timely! We will be going on our monthly trip to The City today. AND we'll be hitting Big Lots! I LOVE your frugal tips! Thank you! Darn! We were just at Big Lots but I skipped the food aisle since I just needed batteries and a few other specific items. That's what I get for taking a shortcut :). I found the Anna's cookies at Big Lots...we bought 20 pkgs! BTW, I also found Hunt's Organic Pasta Sauce -- for $0.70 a can. I bought a dozen cans. How would you keep these (lovely) *white* mitts clean? AM I the only one woh gets food all over hers? I've never tried washing them...can you? Bonnie, you can wash oven mitts! I would hate to think of the alternative! These are actually coated with some kind of stain repellent. I think it's always nice to get a fresh set of hot pads once in a while. They are one of those kitchen items you don't realize you needed to replace until you get a fresh set. Jora, I hope you tasted a box of the cookies before buying that many : ) I would hate for someone to spend $20 on my recommendation alone! We bought one of each flavor, then we drove off to Sam's Club and other errands. As we did errands, we snacked and voted. * 16 more boxes of Anna's cookies. * 1 more box of Peanut Butter candy. * 18 cans of V8 Splash in tropical flavors. Thanks for the tip! I went to Dollar General and got a stash of the Martha DVD's for my gift "store"! Great tip! Thanks for the heads-up on the Hallmark magazine subscription. I have been wanting to subscribe for a long time. What a great price! I went to Big Lots! I hardly ever go in there, and when I do I *never* look at the food, so thanks again Meredith for your tip :]. 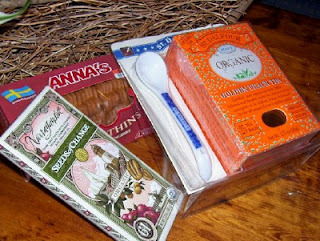 I found alot of the organic brands we buy for 1/4th of the cost- that was exciting! It is very hard to shop[ in there with my four kiddos- the aisles are so small! But it was worth it. I was bummed that I didn't find the Seeds of Change chocolate, though- that's what I went in for (para mi madre). Thanks so much for the Mothers Day gift idea!! !